After almost 30 years, the pieces are finally falling into place to build the Purple Line. But as it decides whether to keep fighting the project, will the Town of Chevy Chase see the writing on the wall? 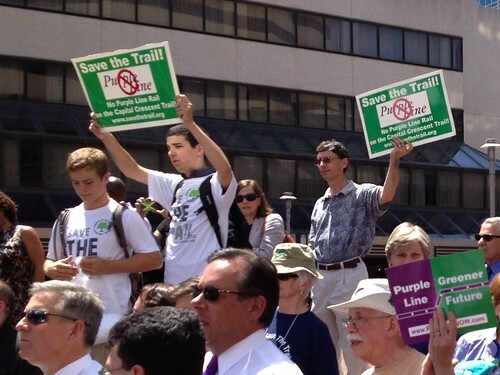 Protesters at a Purple Line event in Bethesda in August. Photo by the author. This week, the Maryland Transit Administration narrowed down the list of private partners to help build and operate the $2.2 billion, 16-mile light rail line between Bethesda and New Carrollton. But on Wednesday night, Chevy Chase held a public hearing about whether to spend $360,000 on legal representation to keep fighting the Purple Line, which passes through it for a half-mile. During the hearing, residents of the affluent town of less than 3,000 people debated the merits of continuing to fight a project that even opponents admit is basically a done deal. Matilde Farren compared the Town Council to change-resistant aristocrat Lord Grantham on the TV show "Downton Abbey." "Trying to keep our town the way it was in the '20s is not realistic," she said. "Times change and we must too." The Federal Transit Administration could approve Maryland's environmental impact study for the Purple Line in a few weeks, making it eligible for federal funding. Once it's approved, the town will have 150 days to file a lawsuit. Chevy Chase will probably argue that the MTA hasn't done enough to mitigate the Purple Line's impacts on the town. Some trees will have to be cut down on the Purple Line's route along the Capital Crescent Trail, a former freight line that was converted to a trail in the 1980's with the expectation that transit would follow. And some of the 30 or so houses that back to the trail might have to get sound barriers or retaining walls. Meanwhile, parents are concerned about losing an at-grade crossing at Lynn Drive that students use to walk to Bethesda-Chevy Chase High School, though the town's been unwilling to consider an underpass there. And environmentalists have taken up the fight for a small, endangered shrimp-like creature in Rock Creek Park that's actually never been seen near the Purple Line route. It's not like the MTA isn't willing to listen. There have been meetings and public hearings about the Purple Line and its earlier iteration under Governor Bob Ehrlich, the Bi-County Transitway, for over a decade. Even the Columbia Country Club, which straddles the trail and has historically been the Purple Line's biggest opponent, agreed last year to lay down their guns and work with them. MTA officials have been communicating with Chevy Chase's Mitigation Advisory Committee since 2009. But town officials haven't spoken to the MTA in months. Instead, the town has spent hundreds of thousands of dollars in recent years to fight the project, including over $430,000 to consultant Sam Schwartz to study alternatives to routing the Purple Line through Chevy Chase and a subsequent review of the state's plans. More recently, it hired law firm Buchanan Ingersoll & Rooney in December and will decide on a longer-term arrangement next month. At the hearing, some residents were prepared to spend more. Doug Kammerer, a meteorologist for NBC4 whose house backs to the trail, compared not hiring a lawyer this time to "entering a fight without a boxer." Chevy Chase previously considered suing the MTA to block the project in 2009 before deciding not to, which came up multiple times during the hearing. "4 years ago we fought this battle," said Jacob Bardin. "We lost something in those years. If we continue this antagonistic view we'll lose more." Bardin was one of fourteen citizens who wrote an open letter to local officials in 2008 decrying the town council's "self-centered" behavior. The town seems to be digging in its heels. Recently-elected councilman John Bickerman vowed to "find a way to defeat" the Purple Line and its supporters, and this last-ditch effort appears to be his attempt to do so. But more residents on both sides of the issue are recognize how bad this fight makes Chevy Chase look. Many speakers at the hearing noted that this effort wasn't about killing the Purple Line, but finding the best solution for their town. "To say we are going to take a step [hiring a lawyer] does not mean we're going to oppose the Purple Line," testified Rolf Sinclair. "We do run the risk for a lot of efforts to squash our attempts at this...people are opposing something that will benefit the working people of PG [County]."